Does what it says on the tin - a very competent stage guitar with a well-balanced acoustic sound that will record very nicely, too. Excellent playability, presentation and amplified performance. Nice to see Takamine hasn't forgotten nylon players. The neck width and spacing is a little cramped if you're used to more standard classical and nylon widths. Takamine has been producing quality guitars since 1962. In addition to its annual Limited Edition models, the Japanese company is perhaps most noted for its stage-friendly electro acoustics. "Takamine's various Pro Series ranges over recent years have become somewhat overwhelming, not to mention confusing. However, simplification is on its way"
For many of us, however, Takamine's various Japanese-made Pro Series ranges over recent years have become somewhat overwhelming, not to mention confusing. However, simplification is on its way. Brand new for Takamine's 50th year, we have the 1, 2 and 3 Pro Series guitars aimed at the gigging musician. Series 4, 5, 6 and 7 guitars are to follow. The product names illustrate the simplification. P, for 'Pro Series' (a catch-all name that indicates Japanese-made guitars), is followed by the construction style: 1, 2 or 3. Then there's the shape: D (dreadnought), J (jumbo), M (orchestra model), N (NEX), F (FXC) and the smallest NY (New Yorker, parlour-style). 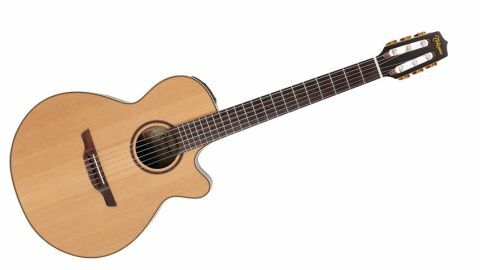 Finally, a C is added for cutaway models, a 12 for 12-strings, while the sole nylon-string gets an additional N. So in the P1JC-12 (reviewed here), we've got a Pro Series 1 Jumbo 12-string with a cutaway. It comes in a good-quality, Takamine-branded hardcase featuring a generous neck cradle, beneath which is a gigging-friendly interior compartment that will comfortably accomodate a strap, set of strings, spare battery, capo and basic tools. Our review model features a pinless rosewood bridge. For anyone who's ever suffered the misfortune of a broken string onstage, pinless bridges allow a replacement to be fitted in super-quick time without the aid of any tools. The two-piece saddle is made from bone. "The crucial power comes from Takamine's proprietary six-element Palathetic saddle pickup partnered by the CT4B II Cool Tube preamp"
The crucial power comes from Takamine's proprietary six-element Palathetic saddle pickup partnered by the CT4B II Cool Tube preamp. Placed just forward of the upper-bout shoulder, it's cleanly laid-out and easy to use mid-song. The control panel offers three centre-indented EQ sliders - which control the low, mid and high frequencies with a +/- 5dB range - and a volume slider. A single push-button engages the tuner; push once to activate, push twice for muted tuning when amplified and a third time to switch off. The tuner is also capable of being calibrated to frequencies other than standard A440 and auto-shuts down after a few minutes if no signal is received. This cutaway FXC is a slightly downsized version of Takamine's highly popular 'mini jumbo' cutaway NEX shape. It's the only FXC in the new Pro Series range, and the only nylon-string, too. As we've seen with Taylor and Martin's latest nylon-string electros, don't think concert classical. Like those guitars, this is very much a steel/nylon hybrid. It has a slightly longer scale length that the other new Pros, a 650mm (25.59-inch) 'modern classical' length, and like the steel strings, we have a cambered fingerboard but with a broader neck and a quoted nut width of 47.5mm (1.87 inches), which measured very slightly thicker. And despite being quoted as having an X-braced solid cedar top, a quick check inside reveals fan bracing suitable for the lighter-tension nylon strings, as you'd expect. This is a 14-fret-to-the-body guitar, so from a distance, only the classical-style slot head and white barrel tuners give the nylon game away, while more eagle-eyed observers will also notice the one-piece saddle. Acoustically the P3FCN certainly isn't the loudest, most projecting nylon-string we've heard. As with Taylor's 712ce-N, we have a more intimate but nicely balanced tonality - definitely more laid-back Latin jazz than powerful concert classical. Amplified, you'll need to watch the low-end, but to be fair, the EQ sliders work efficiently to trim that and scoop the mids for a more 'acoustic' voice. There's a little piezo quack, especially to the lower bass notes. There's no feedback control (Takamine isn't alone here), but it's something to consider for those troublesome onstage environments (aren't they all?). Playability is fine if you're crossing over from the steel-string world, though both E strings are very close to the fingerboard edges, and with the lower-tension nylon strings, you have to fret very cleanly or you'll push the strings off the fingerboard. Also, it'll feel a little cramped in terms of neck width and spacing for the more purist nylonistas out there - an observation, not a criticism, of a well-priced and good-sounding nylon-string electro.